You are viewing the archived 2011 ratings for GPS Navigators. 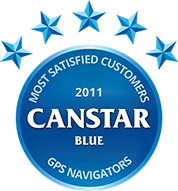 There are no immediate plans for Canstar Blue to update this rating in the future. Canstar Blue research finalised in October 2011, published in December 2011. Both Garmin and TomTom received five star ratings for overall satisfaction, accuracy, features and ease of use. Separately, they excelled in other areas. TomTom received top ratings for price and screen display, while Garmin received five stars for their software upgrades. Our recent survey has revealed that young drivers are hooked on their GPS devices…to the point where they feel unable to function without them. Three in five of Generation Y respondents felt anxious about malfunctioning ‘sat navs’ – three times more likely than Baby Boomers (20%). Generation Y drivers were three times more likely than Baby Boomer drivers (36% compared to 12%) to be solely dependent on GPS software. Forty percent of Generation Y respondents had ceased learning their way around since using a GPS device (compared to 16% of Baby Boomers). This survey also found that two popular GPS brands could not be separated from each other when it came to customer satisfaction. Both TomTom and Garmin received our most satisfied customers award for GPS navigators. NavMan was also rated in this survey. While some Aussies relied heavily on their GPS maps for car trips, our survey results showed that many South Australians bucked this trend. Only five percent of South Australian respondents felt totally dependent on GPS devices, and were less likely than other Australians to feel anxious when their GPS software stopped working (11% of SA respondents compared to the national average of 31%). TomTom, for the second year running, received five stars for overall satisfaction alongside joint winner Garmin. NavMan received four stars for overall satisfaction. TomTom received another five stars for their pricing, Garmin received four and NavMan received three. Receiving another five stars, TomTom excel once again – this time for their screen display. Garmin was close behind with four stars while NavMan received three. Garmin customers were more satisfied with their GPS’s software upgrades (such as updated maps, traffic reports and more). They received five stars for this criteria while TomTom followed with four and NavMan with three. All three brands performed well for GPS navigation accuracy. Both TomTom and Garmin received five stars, and NavMan followed closely with four. If GPS software is easy to use, it makes journeys to unknown destinations much less stressful. Both Garmin and TomTom received five stars for their ease of use and NavMan received four. For extra features, Garmin customers were most satisfied with their product’s features – receiving five stars for this criteria. TomTom came next with four stars before NavMan with three. Canstar Blue commissions Colmar Brunton to survey 2,500 Australian consumers across a range of categories every few months to measure and track customer satisfaction. The outcomes reported are the results from customers of GPS products within the survey group – in this case, 542 people. To qualify, the customer must have purchased a new GPS product in the last two years. Brands must receive at least 30 responses to be included. Brands must have received at least 30 responses to be included. Results are comparative and it should be noted that brands receiving three stars have still achieved a satisfaction measure of at least six out of 10. The ratings table is first sorted by star ratings and then alphabetically. A rated brand may receive a ‘N/A’ (Not Applicable) rating if it does not receive the minimum number of responses for that criteria.